Goody bag giveaway! | gingerbread smiles. Following the meet up I organised I had some goodies left! I can't keep them all to myself so I thought I'd run a giveaway! I have one main prize which includes two 50g packs of Bluebird Tea Co. leaf tea (All Things Nice and Cherry Lips), two sample packs of Bluebird Tea Co. Morning Kick yerba mate tea, two Oqibo sample packs, a Oriflame gloss booster, an Oriflame Wonder lash mascara and a full size Oqibo Hydra Restore cream. There are seven little prizes that you could win which include two sample packs of Bluebird Tea Co. 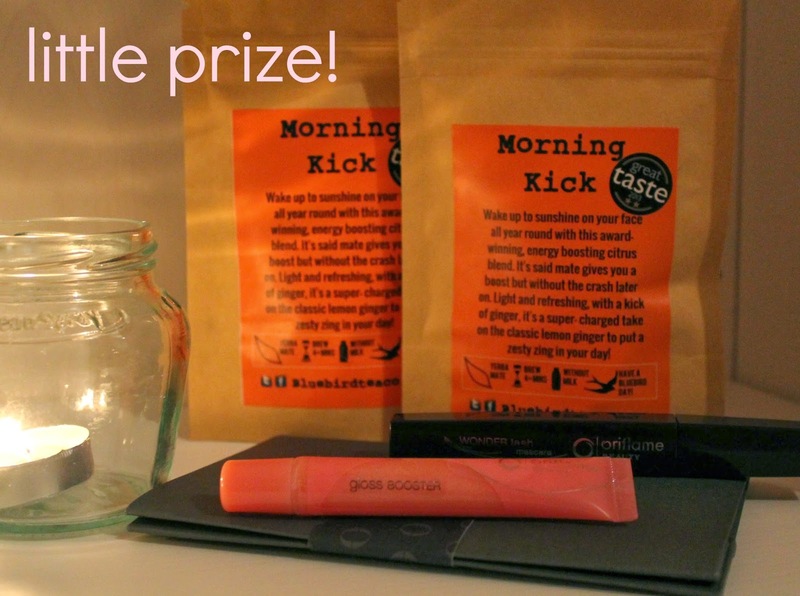 Morning Kick yerba mate tea, an Oqibo sample pack, a Oriflame gloss booster and an Oriflame Wonder lash mascara. 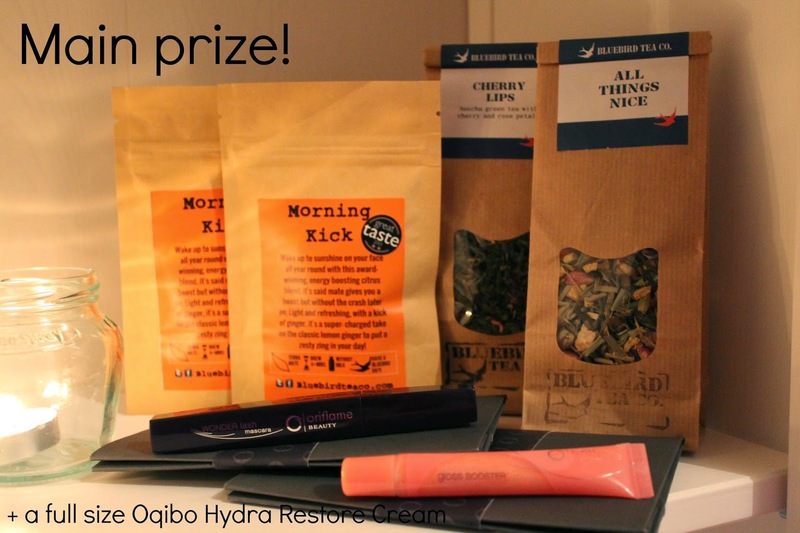 If you'd like to win some yummy tea, luxurious skincare and gorgeous make up then enter below via the rafflecopter widget. This giveaway will run from Sunday 6th April until Saturday 19th April. Winner will be announced Sunday 20th April. To enter you must follow Gingerbread Smiles on bloglovin and facebook and follow @danniannie on twitter. All other entries are optional. I will not accept accounts set up to enter giveaways, only genuine accounts. There will be 8 winners, with 1 winning the main prize. The giveaway is only open to UK residents. Entrants must be over 16 years old. Eight winners will be chosen and they will have 2 days to respond, if they do not manage to reply on time I will draw again. Yay tea! Would love to give it a go, I am pretty fond of a cuppa! I am most excited about the tea, I am a huuuuuuge tea drinker and so always love trying something new! `The morning kick tea - sounds like just what I need every morning!!! That All Things Nice tea.. sounds delicious and I love white tea! I'm most excited about the Bluebird Tea, I've become a little bit obsessed with tea at the moment and would love to try out some more! I don't drink a lot of tea, so I would probably be most excited about delving into the tea world and trying some different flavours.